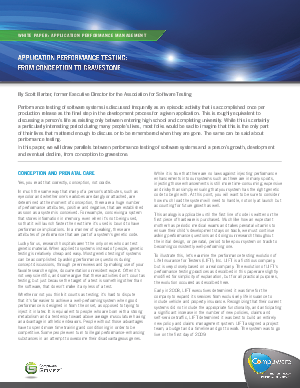 Performance testing of software systems is frequently discussed as an episodic activity that is accomplished once per production releaseas the final step in the development process for a given application.This is roughly equivalent to discussing a person’s life as existing only between entering high school and completing university. While this is certainly a particularly interesting period during many people’s lives,most folks would be sad to imagine that this is the only part of his orher life that mattered enough to discuss or to be remembered whenthey are gone. The same can be said about performance testing.